I just finished teaching my first businesss ethics philosophy course. The Oxford textbook was fairly good but one subject it did not cover was apologies. What do we do, as professionals, when we do fail to be ethical? This post offers a brief answer to that question. Name exactly what you did wrong, and claim it. Express sorrow for your decision to do wrong, for your action. Express your understanding of how your decision impacted others, how they felt or must feel, and how they must be disappointed. Resolve to make it right, or – if amends are not possible – resolve to work toward not doing this particular wrong again. If possible, do all four briefly, and move on. For example: Suppose Bob agrees to meet Carrie at noon, and shows up late. He promises to be on time next week and shows up late again. Quick, easy, sincere, and thorough. What about the Fauxpology? How do you avoid the “Sorry not sorry” apology? To make your apology sincere and successful, make each step separate and clear. 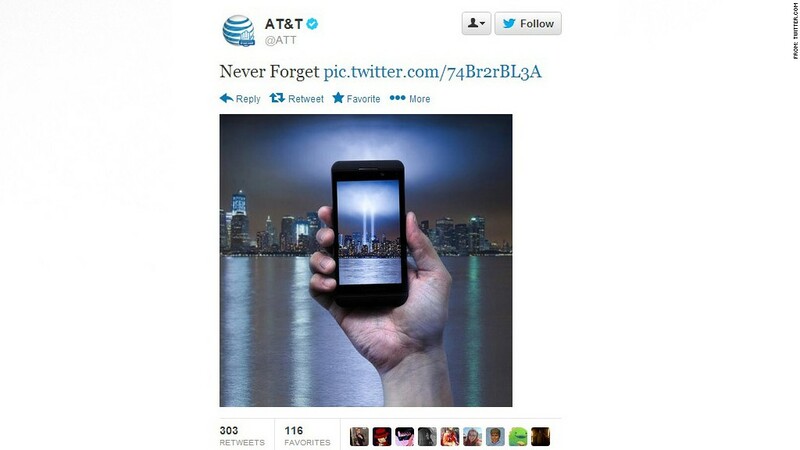 An example from business ethics is when AT&T back tracked away from a tacky tweet. The memorial features two columns of light representing the fallen Twin Towers. “Never Forget,” the post said. The tweet, which AT&T posted at 12:15 p.m. ET Wednesday, quickly went viral. Some Twitter users replied with expletives, while others called it “tacky,” “disgusting” and “tasteless.” Others threatened to switch carriers. The tweet was up for only an hour before AT&T deleted it and posted an apology. AT&T didn’t immediately respond to a request for comment. The apology wasn’t enough to quell angry Twitter users, some of whom considered AT&T’s mea-culpa to be tone-deaf. The reason people were rightly insulted by AT&T’s apology is that AT&T did not offer an apology. They were simply responding to the pressure from custumors. They said “we apologize” but immediately clarified that the image was “meant to pay respect”. In other words, sorry not sorry. Another business ethics example is from Tony Hayward, the president of BP. He famously “apologized” for the Gulf Spill of 2010. The Gulf spill is a tragedy that never should have happened. BP has taken full responsibility for cleaning up the spill in the Gulf, we’ve helped organize the largest environmental response in this country’s history. More than 2 million feet of boom, 30 planes and over 1,300 boats are working to protect the shoreline. Where oil reaches the shore, thousands of people are ready to clean it up. We will honor all legitimate claims. And our cleanup efforts will not come at any cost to taxpayers. To those affected and your families, I am deeply sorry. The Gulf is home for thousands of BP’s employees and we all feel the impact. To all the volunteers and for the strong support of the government, thank you. We know it is our responsibility to keep you informed. And do everything we can so this never happens again. We will get this done. We will make this right. Notice what is missing from Hayward’s apology? Step 3 gets a heartfelt sentence; Step 4 consumes most of the oxygen in this “apology.” But when you listen for Steps 1 and 2 you only hear crickets. Hayward carefully avoids admitting BP did anything wrong. From this statement, all one hears is that the Gulf Spill is a “tragedy” (which could mean chance or fate is to blame, not BP). A tragedy is not a crime; a tragedy is not a sin. Carelessness is a sin; negligence is a crime. Is BP admitting either of these? Not here. The truth and moral law don’t change for us. We do not get to decide what is ethical or unethical. We can’t change the rules to match our behavior, like an archer drawing a target around his arrow. When we fail to meet the moral law, we must acknowledge this failing and apologize. Human nature is flawed. Intellectual mistakes and moral mistakes happen. We all make them. Every human judging another person’s flaws is a pot calling a kettle black. However, we all have the expectation that others obey the moral law and the responsibility to hold ourselves to that law. Even good people do bad things. There is no easy bifurcation of business people into “good” or “bad” people. There are no such thing as “ethical” or “unethical” businesses – not even Enron! Apologizing is always better. The impulse to cover up moral failings is strong; Adam and Eve felt it in the Garden. We may judge our own sin less harshly if “no one knows” but when others hide their sin more we judge more harshly. Just admit it, early, and apologize. Even in a court of law, judges and juries are more lenient on lawbreakers who know that they did something wrong, feel bad for it, feel sorrow for the affected, and who have resolved to change. Consult your lawyer before admitting guilt in writing; but consider that it might be better to come out with it.